Soft cotton vests that keep everything in the right place, stop the embarrassment of nappies being on display, and keep you or the person you care for warm and comfortable all day and through the night. 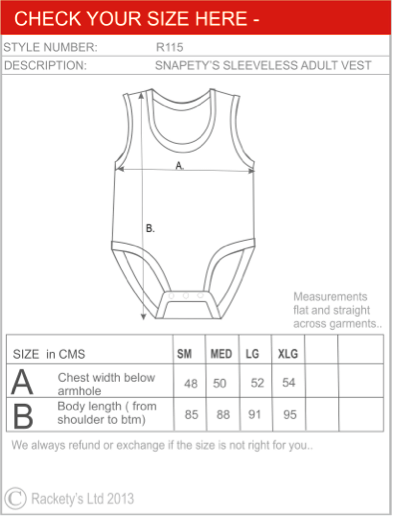 Rackety’s bestselling vest, great as a start point if you have not tried a popper vest before. PLEASE ALLOW APPROXIMATELY 14 DAYS FOR ORDERS WITH NEW COLOURS AND PATTERN FABRICS. ♥ 100% pure soft cotton knit fabric. ♥ Adults with learning difficulties or physical disabilities.